Mulayam Singh and his cohorts sing Bloodhound Gang’s “The Roof is on Fire”(we don’t need no water let the motherfuckers burn) while the records of their sterling efforts to convert Uttar Pradesh into what BigB called Uttam Pradesh (Amitabh Bachchan would be well advised to drop all prints of Toofan and Ajooba in the bonfire also) go up in smoke. Amar Singh’s phone calls are met with a “This number does not exist”, Jaya Prada comes to the realization that she just may have had the last of her 35 lacs a pop dance performances paid for by the government of UP. Jaya Bachchan understands that the people of UP do not really see her as an Aishwaryan daughter-in-law who is quiet, listens and stands behind which is why her vote-grub: that of being a bahu, who had “rarely asked them for anything” fell on cold ears. Celina Jaitley learns a life lesson that it is one thing to push up her assets and quite another thing to keep upthrust the Congress’s flagging fortunes. And amidst all the smoke and introspection, Mayawati, is crowned the empress to cheers of “Huzoor Waah Taaj boliye” bringing to a spectacular climax the Kumbh mela for criminals otherwise known as the Uttar Pradesh elections and starting off yet another series of manic transfers within a few hours of her ascension. With an absolute majority and now in striking distance of her ultimate ambition: to be India’s most outrageously fashionable Prime Minister, Mayawati’s ascension to the top has been spectacular. With the “Tilak, tarazu aur talwaar/ Maro inko jootay chaar” violently casteist slogans being sought to be downplayed for a kinder, gentler upper-caste friendly image brought out about by the cute realization that the elephant symbol of the BSP is actually the Bramhinical Ganesh, Mayawati’s inclusive politics this time round is a winner, not just for the votes it has gotten her. For the first time in many years, an egalitarian order may be established in UP where for the most part, the privileges you can extract from the government will be governed simply by the cash you can shell out and by how many times you touch your head to Mayawati’s feet and not by your caste and religion. Ironically, this is the most social justice you can ever expect in Uttar Pradesh. Ah, the flourmaster bakes a cake fresh from the oven, and I’m the fusst customer! Me likey. A tad too many linkstootie-frooties, but delicious, as usual. Since there is a lot of stress on caste, hope people see beyond it, and development will take front seat, Hope the “Maya” will work wonders in UP. It’s not absolute majority for BSP in UP. It’s simple majority. Absolute majority is winning two-thirds and above of the total seats. Example, Congress in Loksabha 1984-85. The only good thing that has come out of these UP elections, as far as I am concerned, is that the nauseating Amitabh-Amar Singh combo has been given a round thrashing by the public. At least it proves that people are more intelligent than they thought. “UP mein dum hai, kyonki jurm yahan kam hai” indeed! Show me one place in India where this is NOT the case. Isn’t it that everywhere you need cash to get the job done. The worse thing that Mulayam govt. brought in was the sheer number of hardened criminals. His party is like a whos who of history sheeters. The most important thing UP needs now is peace and law and order. 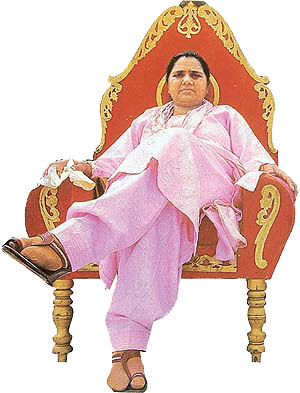 I think it’s a remarkable victory for Mayawati. No one really plugged for her – not the media which was busy covering Rahul Baba’s little antics when not following Big B or Celina Jetley; not the moneybags who were either with BJP or SP; nor the babus who were either reporting to Mulayam or the Election Commission. Mayawati worked quietly to build a coalition (of Dalits, Brahmins and Muslims) that the Congress would have given its left hand to regain (with the right it would be flagging for votes, I guess, or else it would have given both). The BJP too would have given a lot to gain the credibility she enjoyed with the electorate as the person who can set the state’s law and order situation right. She changed gears, as GB pointed out, from her pugnacious anti-upper caste rhetoric to devise smart inclusive slogans that not only sounded good but actually persuaded upper castes like Brahmins to be led by a Dalit formation. Nothing like this has happened in north India before. And I agree with Gadfly that virtually all state govts espouse a cash-for-favour policy. Within that matrix, it’s really a matter of degrees. Obviously Maya’s record (the Taj corridor case notwithstanding) isn’t as bad, or else people, cutting across castes, wouldn’t have voted for her. Personally, I am looking at this BSP stint with some interest. The other remarkable story from UP has been BJP’s marginalisation. Not only has it got the least number of seats since 1985, there has been a 6.6% swing away from it — and this when it was not affected by the incumbency factor. A report in TOI says that more than half its seats were from cities and district towns, indicating that its vote has once again become largely urban. It was this way for the BJP pre-Ram Mandir movement when it was called a `Bania, Brahmin Party’ in UP. Wonder if it’s going that way again. If it is, the chances of it bringing in a saffronite as PM after the next Lok Sabha poll in case Cong simply loses the plot (as most ruling parties tend to do, and so it seems with the Cong), could become remote. Even if a non-Cong coalition wins, someone else is likely to be PM. It could be Chandrababu Naidu. Or it could be Mayawati! for analysis of UP election – 2007. This is just starting of new revolution. YOU WILL SOON BSP’S ELEPHANT RIDING IN MAHARASHTRA, MADHYA PRADESH & DELHI.